Uploaded files will be displayed as show below and will include details of who uploaded the file and when. Any tags that have been assigned to the file can also be seen. Files can be edited in a couple of ways, Bulk Editing and via the File Edit Window. Bulk Edit refers to the action of selecting one or more documents within a folder and applying the same action to them all. 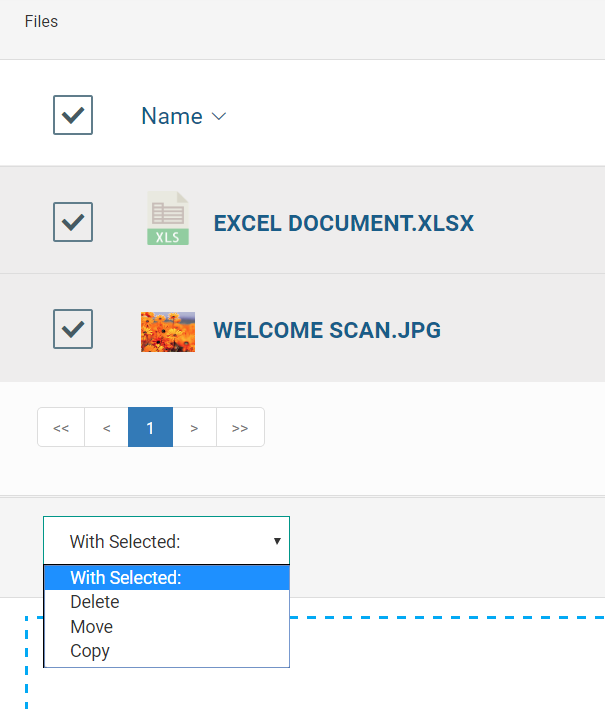 As the image shows on the right when files are selected a menu will appear from which you can select to either Delete, Move or Copy the selected files. Clicking on a file name will open the file Edit Window that contains various actions that can be applied to a file. Latest Comments: Displays any comments that have been added to the document. These comments will be visible to all users that have access to the DMS. 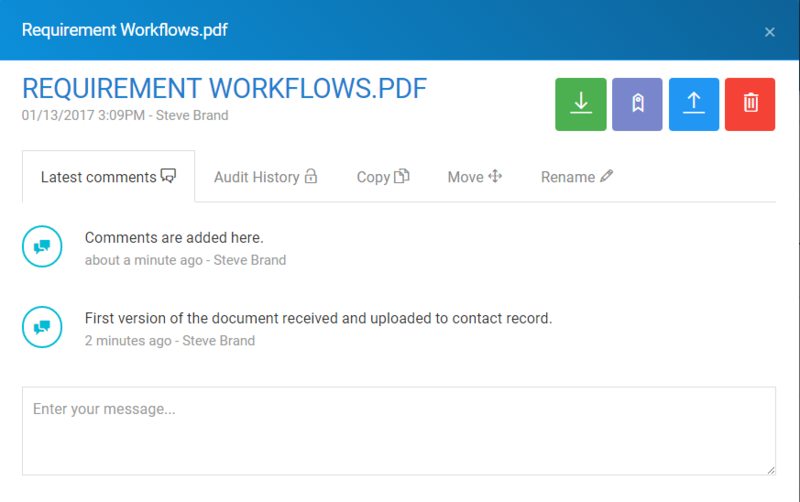 Audit History: The Audit History will document activity relative to the selected file such as when the file was uploaded, renamed etc. Copy and Move: Copying or Moving documents is attained using the same method as used with folders. Once the desired folder has been chosen and highlighted as shown below the document can be moved accordingly. Rename: Within this area you can rename files by selecting rename from the top bar, choosing the new file name and pressing the ‘rename file’ button in the bottom right of the window. Download File: Will download the chosen file to your device. Update File: Allows you to replace the file by uploading different one using the same method as the original file upload. Note: The file type must be of the same type as the original file. Delete File: Will allow you to delete the file. A confirmation message asking you to confirm deletion of the file will be displayed.